A computationally-efficient method based on Kalman filtering is introduced to capture “on the fly” the low-frequency (or very large-scale) patterns of a turbulent flow in a large-eddy simulation (LES). This method may be viewed as an adaptive exponential smoothing in time with a varying cut-off frequency that adjusts itself automatically to the local rate of turbulence of the simulated flow. It formulates as a recursive algorithm, which requires only few arithmetic operations per time step and has very low memory usage. In practice, this smoothing algorithm is used in LES to evaluate the low-frequency component of the rate of strain, and implement a shear-improved variant of the Smagrosinky’s subgrid-scale viscosity. 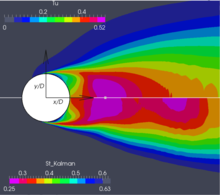 Such approach is primarily devoted to the simulation of turbulent flows that develop large-scale unsteadiness associated with strong shear variations. As a severe test case, the flow past a circular cylinder at Reynolds number $Re_D=4.7\times10^4$ (in the subcritical turbulent regime) is examined in details. Aerodynamic and aeroacoustic features including spectral analysis of the velocity and the far-field pressure are found in good agreement with various experimental data. The Kalman filter suitably captures the pulsating behavior of the flow and provides meaningful information about the large-scale dynamics. Finally, the robustness of the method is assessed by varying the parameters entering in the calibration of the Kalman filter.